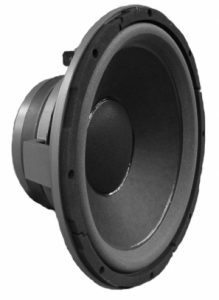 In addition to parts and service for older Altec Lansing loudspeakers, Great Plains Audio manufactures an ever-increasing number of finished loudspeaker products for use in professional and audiophile systems. Great Plains Audio continues the Altec tradition of manufacturing individual loudspeaker components of the highest quality and outstanding performance characteristics. Whether you need horns, high-frequency compression drivers, low-frequency loudspeakers, two-way loudspeakers, or crossovers, GPA has what you need! 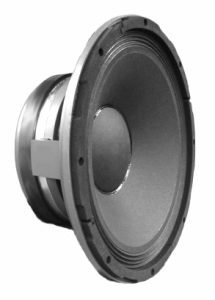 Our loudspeaker components are excellent companions to existing Altec Lansing products too, and are also popular as replacements when the originals have been damaged or lost. Our high-frequency compression drivers exhibit smooth, natural reproduction without the self-induced distortion found in most other manufacturer’s products. 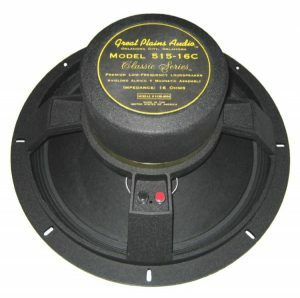 All GPA HF Compression Drivers can be mounted to any Altec Lansing High-Frequency Horn, or to one of those we provide. Carrying on the Altec tradition of natural sound reproduction and superior efficiency, our low-frequency loudspeakers are made to the most exacting tolerances in the industry. Whether you need replacements for original woofers in a famous Altec Voice of the Theatre® system, are designing a professional sound reinforcement system, or are building a home theatre system of the highest quality, Great Plains Audio has a low-frequency loudspeaker that will do the job properly at a reasonable price. Our 515G-series of low-frequency loudspekers are world famous for their natural, smooth performance, and excellent transient response. Our current version, the 515G-series, is specifically designed for use in bass horn enclosures, and is optimized so as to provide the most natural frequency response in them. Our 515-8LF Low Frequency Loudspeaker is a reintroduction of a famous Altec design with a new twist – it’s rear vented. This loudspeaker, which has long been popular for use in many venues, is now made even more versatile due to this new feature, making it at home in both bass horn and vented direct radiator enclosures. Our 416-8C Low Frequency Loudspeaker is a reintroduction of another famous Altec design found in the famous A-7 Voice of the Theatre® System. This loudspeaker has long been regarded as the finest sounding 16″ woofer ever made, and is equally at home in large full-range sound reinforcement systems and home theatre systems where accuracy, efficiency, and excellent low-frequency response are required. Our 3000-series of Low Frequency Loudspeakers were specifically designed for sound reinforcement applications, and have also found their way into home theatre and many other types of systems. Outstanding performers, they offer extremely linear performance at low distortion within their rated bandwidth. 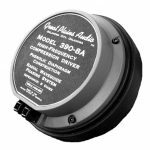 For smaller, full-range applications, the GPA Model 3124 Low-Frequency Loudspeaker is an excellent choice. With it’s heavy, cast 12″ frame and it’s low free-air resonance of 26 Hz, it is an excellent performer for smaller systems that require smooth low-frequency response with minimal distortion. 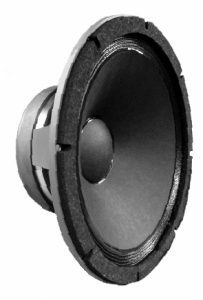 For smaller applications that require higher SPL output, GPA offers the Model 3127 Low-Frequency Loudspeaker. Capable of handling large amounts of acoustic power for a speaker it’s size (12″), the 3127 is an excellent choice for use in smaller sound reinforcement systems requiring excellent low-frequency response with minimal distortion at higher sound pressure levels. 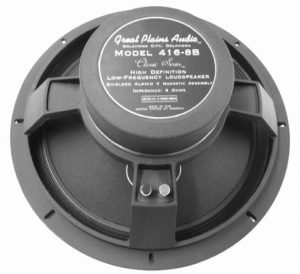 One of the best sounding 16″ Woofers we make, the GPA Model 3154 Low-Frequency Loudspeaker is a superb loudspeaker. It’s low, free-air resonance of 25 Hz allows it to perform exceedingly well in tuned vented boxes with extreme naturalness and minimal distortion. It is a great choice for use in medium-to-large sound reinforcement systems requiring excellent low-frequency response, and for use in high-quality home audio systems. 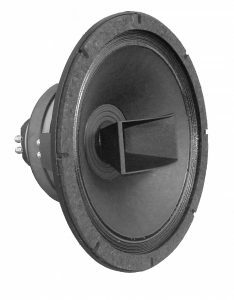 One of our most popular woofers for use in direct radiator enclosures is our Model 3156 Low-Frequency Loudspeaker. Built on our massive 16″ frame, it is a real powerhouse. Incredibly efficient, it performs equally well in nearly all venues, from large sound reinforcement systems for houses of worship, stadiums, arenas, and high-end music systems, all the way to home theatre systems where high-output with low distortion are required. Our 18″ Model 3184 Low-Frequency Loudspeaker is, quite simply, an fantastic woofer. 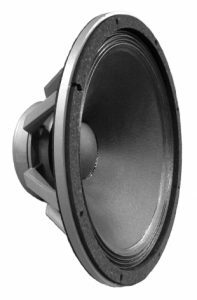 Designed for use as a sub-woofer, when used in our Model 8184 Enclosure, it produces a whopping 117 dB of SPL with a mere 300 watts of audio power. Yet, with all that output, it is amazingly linear and exhibits very low distortion. Great for large sound systems and home audio systems where performance takes priority over space limitations. In 1944, Altec Lansing released what is possibly the most famous loudspeaker ever made by anyone – the 604 DUPLEX®. 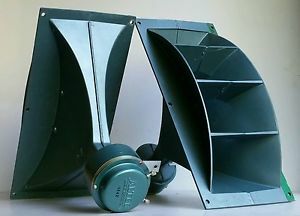 A 15″ co-axial loudspeaker, it revolutionized the studio monitoring world, and became the world standard by which all others of it’s type that would follow for the next 50 years. Nothing sounds more natural and lifelike than a properly operating 604! We are proud to offer the 604 in two different versions, and it’s new 12-inch baby brother, the Model 212-8A. The newest addition to our family of two-way loudspeakers is the Model 212-8A 12″ Loudspeaker. Differing from the 604-series, which uses two separate magnetic assemblies mounted together, the 212-8A uses one large magnet for both high and low frequency sections. This method of manufacture not only reduces material costs, it actually improves the performance of the two by reducing magnetic flux interference. It is supplied with our proprietary passive crossover of the highest quality components, or it can be ordered without the crossover for use in bi-amplified systems. Perfect for hotel ballrooms, high-quality background music and paging systems, and, with the addition of supplemental LF loudspeakers, they work very well in studio monitors, critical listening rooms, and home audio systems. Our 288-8H (16H) is a large format [1.4 in. 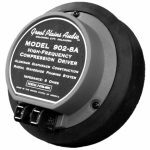 (36 mm) diameter throat exit] high frequency compression driver, featuring a 3.4 lbs. (1.54 kg) Alnico V magnet, which produces an [at-rest] gap flux density of 2.05 T. It also features a 2.8 in. (71 mm) diameter, edge-wound, copper/clad aluminum-ribbon voice-coil. The voice-coil is attached to a high grade aluminum alloy diaphragm. Sound waves from the high frequency voice-coildiaphragm assembly are channeled through our Radial Waveguide phasing system. This system provides the proper phase relationship between the sound waves emanating from the center of the diaphragm assembly and the sound waves emanating from the edges of the diaphragm assembly. An exponential throat is utilized to pass these phase coherent sound waves through the body of the driver to its exit port. Our model 414-8B (16B) is a 12 in. (305 mm) low frequency loudspeaker. Because of its size, our 414-8B (16B) loudspeaker is ideal for use in moderately dimensioned sound reinforcement and high-fidelity applications. 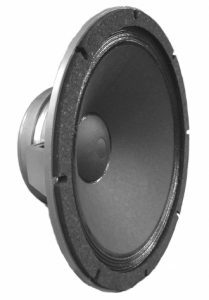 This loudspeaker features a structurally reinforced, die-cast, aluminum frame. The frame’s 8 mounting bolt slots will accept a 0.25 in. (6 mm) diameter bolt or smaller, allowing the loudspeaker to be attached to almost any secure surface by either a front mounting or rear mounting method. Also featured is a 1.8 lbs. (0.8 kg) AlNiCo V magnet, which produces an at-rest gap flux density of 0.9 T. Another feature is the 3 in. (76 mm) diameter, edge-wound, copper-ribbon voice-coil. This voice-coil is attached to a high grade fiber cone. The cone is secured to the frame with a high compliance cloth surround. 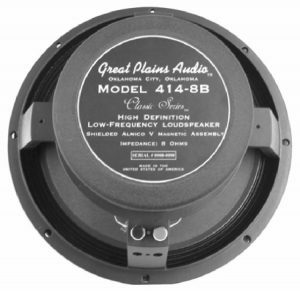 A complete 414-8B (16B) voice-coil-cone assembly is manufactured and sold by Great Plains Audio as a direct replacement part. Great Plains Audio’s parts support assures the same dependable operation with our new products as our parts support has provided for many original Altec Lansing products. Our model 416-8B (16B) is a 15 in. (381 mm) low frequency loudspeaker. This model’s characteristic performance, including extremely smooth response and extraordinary linearity, makes it ideal for use in a wide-range of sound reinforcement and high fidelity applications. Also featured is a 2.44 lbs. (1.1 kg) AlNiCo V magnet, which produces an at-rest gap flux density of 1.1 T. Another feature is the 3 in. (76 mm) diameter, edge-wound, copper-ribbon voice-coil. This voice-coil is attached to a high grade fiber cone. The cone is secured to the frame with a high compliance cloth surround. 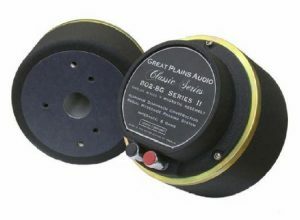 A complete 416-8B (16B) voice-coil-cone assembly is manufactured and sold by Great Plains Audio as a direct replacement part. Great Plains Audio’s parts support assures the same dependable operation with our new products as our parts support has provided for many original Altec Lansing products. Great Plains Audio is pleased to reintroduce one of the finest low-frequency loudspeakers ever built, the Model 515-C Series Low-Frequency Loudspeaker. 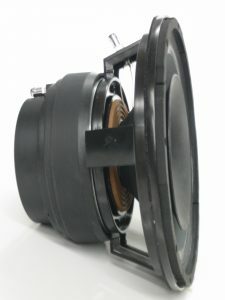 The Model 515-C is part of GPA’s new Classic Series of loudspeakers, all of which are hand-made, incorporating precision manufacturing practices, a distinctive paint scheme, and featuring the superb sonic performance that can only be achieved through the use of massive AlnicoV magnetic assemblies. In addition to the powerful AlnicoV motor structure, the GPA Model 515-C Series Low-Frequency Loudspeaker utilizes a relatively light cone assembly. The result is a low-frequency loudspeaker that exhibits the highest possible conversion that is ideal for use in bass-horns, direct radiator enclosures, or in multiple arrays of low-frequency units. Our 802-8G (16G) Series II is a small format [1 in. 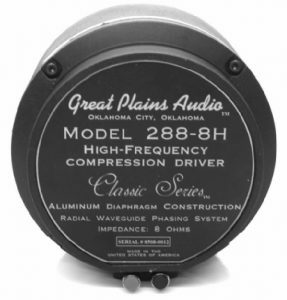 (25 mm) diameter throat exit] high frequency compression driver, featuring a 1.2 lbs. (0.54 kg) AlNiCo V magnet, which produces an at-rest gap flux density of 1.525 T. It also features a 1.75 in. (45 mm) diameter, edge-wound, aluminum-ribbon voice-coil. The voice-coil is attached to a high grade aluminum alloy diaphragm. Sound waves from the high frequency voice-coil diaphragm assembly are channeled through our Radial Wave-guide phasing system. This system provides the proper phase relationship between the sound waves emanating from the center of the diaphragm assembly and the sound waves emanating from the edges of the diaphragm assembly. An exponential throat is utilized to pass these phase coherent sound waves through the body of the driver to its exit port. We designed our 802-8G (16G) driver for coupling to any of the industry standard multi-cellular, sectorial, or constant-directivity horns that have a 1 in. (25 mm) diameter throat entrance. These horns can be secured to our 802-8G (16G) driver by either the two-bolt mounting standard [bolt centers on a 3 in. (76 mm) diameter] or the three-bolt mounting standard [bolt centers on a 2 in. (51 mm) diameter]. 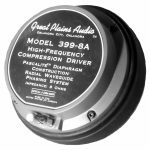 The Great Plains Audio Model N604-8A is a 12-dB/octave dual-section passive crossover network having a center frequency of 1,500 Hertz. 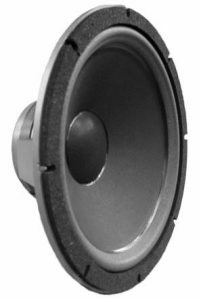 It is designed specifically to provide smooth response from our Model 604-8H-III Loudspeaker throughout its bandwidth. This combination results in a speaker system that is ideal for use in home theatre and high-quality audiophile systems, recording studios, and professional sound system installations. The N604-8A is not an “off-the-shelf”, generic crossover, conceived by computer with resistive loads. Instead, it was created through extensive tests using an actual 604-8H-III loudspeaker in it’s proper enclosure in real time. This method of design resulted in a crossover that has been optimized for the 604-8H-III, which enables it to exhibit well balanced, phase-coherent performance at high power levels, but with ultra-low distortion. 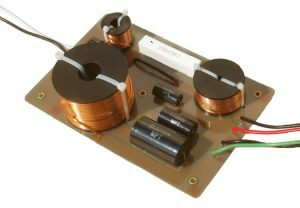 The N604-8A Crossover is constructed using the components of the highest quality, including air-core inductors, polypropylene capacitors, and non-inductive wire wound resistors, which are mounted to a printed-circuit board having large copper traces. Connections are made using large, 12-gauge stranded wire, which allows for efficient transfer of audio power from the amplifier to the speaker. 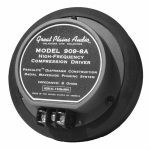 The GPA Model N604-8A Crossover is the choice for use with our Model 604-8H-III when clear, natural, and uncolored sound reproduction are essential, and high power handling with low distortion are required. Though specifically designed for our Model 604-8H-III Two-Way Loudspeaker, the N604-8A Crossover is also quite suitable for use with earlier Altec Lansing® 604-series loudspeakers. The 604-8G, 604-8H, 604-8K, and 904series loudspeakers all perform well using this crossover.